Join Three Guys Adventure on this 8-day, thrilling mountain getaway to experience the diversity between the busy city life and the silence on top of one of Arunachal's most spectacular mountains. Enjoy 8 days of trekking through alpine meadows, isolated villages, dramatic glaciers, and inspiring mountain vistas. At 14,108 ft, Mirathang is one of the highest mountains in the Arunachal Pradesh. Its surrounding sister mountains are equally imposing and create magnificent panoramas from any view point. This trek covers a wide variety of terrain, from lowland pastures and peaceful villages to powerful glaciers and stunning mountain views. In the rugged mountain scenery, you will stay in mountain communities and meet friendly local hill people as they go about their daily lives. The expedition is not only visually superb, but also provides a chance to learn about local cultures. Along the way, see thundering waterfalls of melted snow, cross icy rivers and high mountain passes, and reward yourself with a soak in natural hot springs. The whole trekking trail has the potential to give every adventure enthusiast goosebumps, owing to the topography that consists of sub-tropical and coniferous forests, grasslands, pastures, etc. With a number of icy lakes and natural forests all along the path, you will get an opportunity to explore a number of flora and fauna species such as pine, oak, chesnut, juniper, rhododendrons, etc. Arunachal Pradesh is known as the Orchid State of India that offers awe-inspiring aesthetics and amazing treks for adventure enthusiasts. One of them is the Bailey trail trek. This historic route was named in the name of British Officer Lt. Col. F.M. Bailey, who, with Capt H.T. Morshed, were commissioned to survey the lands between Arunachal Pradesh and Tibet during 1911- 12. In ancient days, this route was used for trade in between India, Burma and Tibet. The trek connects a series of interlocking valleys, linked through six major passes reaching up to 14,800 ft. Trekkers may enjoy occasional glances of peaks of Gorichen and Kangto. The trail is covered with forests wilderness and desolate pasturelands. Camping in the magnificent Jithang! On your Bailey Trail trek, you'll often find this time in camp to be one of the most enjoyable aspects of the trip! After a day of trek, you'll look forward to watching the sun cast its final rays across the mountains as the first of billions of stars begin to appear. You'll look forward to awaking to the sound of the wind and river wren at first light. Camping in along the Jithang will be truly an unforgettable experience. Whether you're a veteran camper or experiencing sleeping in the outdoors for the first time, Three Guys makes camping simple. All you need to worry about is packing your personal items in your backpack. They'll supply the rest. Bathing in the Hot Springs! It requires a bit of a hiking to reach Mago's Hot Springs, but to be able to soak at the end of the trek is worth it. This is the perfect way for you to relax, restore, and rejuvenate. You can soothe your sore muscles after a long day of hike. The natural springs offer incredible views, warm mineral water, and an abundance of peace and quiet. The healing powers of these hot springs have been used and valued by people for thousands of years. The bubbling waters of hot springs contain a variety of minerals with natural restorative properties. When you bathe in a hot spring, your skin soaks in these minerals, increasing circulation and oxygen flow, much like when you exercise. Report a day before in Guwahati if possible. You can reach Guwahati by travelling in a train or flight. Feel free to explore the city, but make sure you're in time in the morning to meet the group. Your Group Representative will review the details of your tour. The adventure begins this morning. Feel free to explore before your welcome meeting, but make sure you're back in time to meet the group. After introductions, your trek guides will review the details of your tour. Depart towards Dirang. Make stops along the way as you pass/enter the gorgeous Arunachal Pradesh – the elevation ascends the whole way. Lunch will be at Bhalukpong and by evening, you should arrive at Dirang. Spend the night in Dirang, check out the Buddhist Monastery, local culture and food. Below is an example of the hotel guides may use in this city. For the actual hotel your specific departure will be using, please check your voucher. Depart in the morning for New Melling and reach by afternoon. Spend the night in New Melling, relaxing and enjoying this fascinating place under the sky besides the roaring river, and getting used to the altitude. Get your blood pumping on this first day of hiking around the small village. The trekking is fairly easy and serves as good training for the next few days. Pass rambling rivers and a small village, and enjoy scenic mountain views; it's just a taste of what's to come. 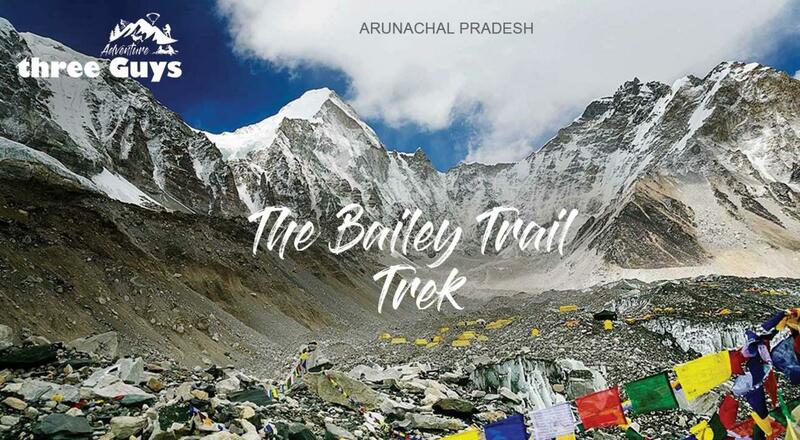 Today, your Bailey trek begins. Enjoy a full-day guided tour of the beautiful paradise of the Himalayas. Take the hike slow, and drink lots of water along the way – amazing views are waiting as a reward. Enjoy ample time to rest and relax after reaching the camp; most campers arrive around late afternoon. Hiking the meandering streams, stunning scenery, and ancient route used for trading will be truly an unforgetful experience. You can enjoy your day enjoying/bathing in the hot springs and visit the small Mago Village uphill to meet local Monpa folks there. Spend time around the camp or go further afield. Free time can be used to explore any way you want. Trek over progressively spectacular and steeper terrain and higher altitudes on your way to Jithang (14108 ft). Hikers can catch the glimpse of the mesmerizing snow-capped mountains. Most hikers reach camp by early afternoon, with ample time to rest and relax. Ascent higher through the woodland, with views of the Mirathang Glacier stretching out ahead. Passing through dense forest, the trek ends here (14764 ft), where there are incredible mountain views across the region. The route to Mirathang towards the base camp passes through some open valleys, a reminder of all the snowfall that can occur in winter. With incredible views of the Mirathang and, in particular, the views of Gorichen Glacier, the hiking today is worth the challenge. Travel back from Merathang to Mago and spend the night in Mago. It is the last day of the trek today, be sure to look back at the views of the high peaks of the Gorichen as the trek winds through green fields and forests before joining up with the road back in New Meling and the transfer back to Dirang. Depart towards Dirang. Settle in and scan the scenery from the convenience of a private vehicle. Return to Guwahati for a well-earned celebration. Today, you return to Guwahati where you will have free time, perhaps for some last minute shopping, or visit the beautiful and holy Kamakhya Temple. Transportation to and from Guwahati to New Melling and return back. TGA will take care of all your inner line permits and village management fees. All you need to worry about is packing your personal items in your backpack, TGA will supply the rest. From freshly laundered sleeping bags, to 2-men, 4-season tents and sleeping mats. Porter charges during trekking (on twin sharing basis).